Seta Chorbadjian is the owner and groomer of Posh Paws Grooming & Pet Spa. A few years ago, Seta lived in Toronto, Canada. She had a little doggie named Ringo, a dachshund/chihuahua mix. When she decided to get a companion for Ringo, research led her to a dachshund rescue in Birmingham, AL. A beautiful dachshund named Jenna was driven by volunteers from Alabama to Toronto. Seta’s passion for her dogs and her fascination with the rescue world led her to volunteer for the Canadian Dachshund Rescue that was just being formed. In 2000, she joined their board of directors and was their foster coordinator for about three years. Soon after, her career led her to work and live internationally. Her dogs and cats accompanied her overseas. She continued to volunteer for rescue organizations on part time basis. In 2008, she met her husband and moved to Greenville, SC along with her two dogs and two cats. In the mean time, Seta’s pets were the catalysts in helping her to embark on a career change. Thus the journey into the pet profession began. Her new dog Simon, a Lhasa Apso, was a difficult dog to groom. He was a fear biter and often was only groomed when anesthetized at the vet’s for a procedure. Seta understood that Simon deserved better. She researched grooming schools and landed at Greenville Technical College in their Small Animal Care and Professional Pet Grooming program. She completed the program and graduated with a grooming certificate. The following year, while her salon was being renovated by her supportive husband, Seta poured herself into furthering her education in cat and dog related fields. She received training by leaders in the pet grooming industry. 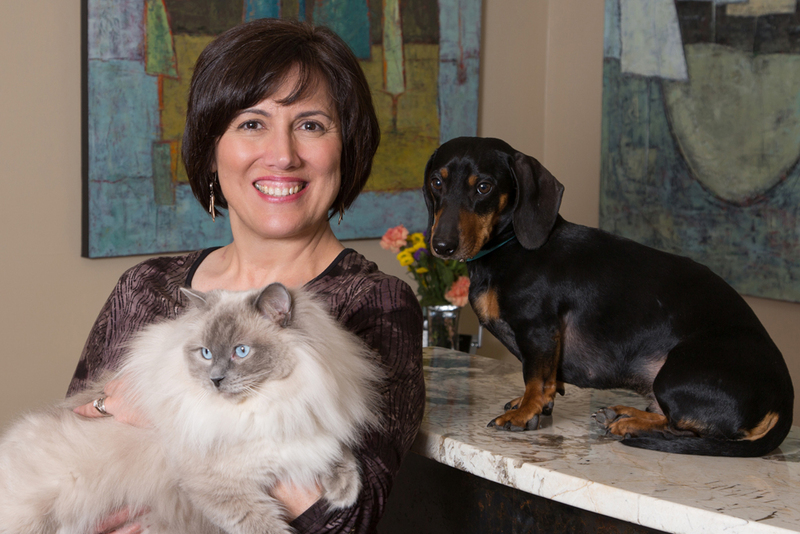 In her pursuit for total pet care and well-being, she attended canine massage training in Cleveland, Ohio where she studied the Integrated Touch Therapy Inc. curriculum and she received her Canine Massage Practitioner certificate in 2011. Early in 2012, Seta joined the National Cat Grooming Institute of America (NCGIA), a cat-exclusive grooming school where she pursued certification in the art of feline grooming. She received rigorous training in pet first aid, breed recognition, coat and color identification as well as health and disease recognition and prevention. Seta holds the title of Certified Feline Master Groomer (CFMG) and she’s one of only 85 CFMGs in the nation. Seta continues to contribute to her community by volunteering her time to groom for rescue organizations and animal shelters in Greenville, SC. Her most recent adopted rescue is Freddie who was lovingly dubbed Freddie Mac. Sadly, Freddie was dumped at a shelter in VA. The kind volunteers at Furever Dachshund Rescue arranged to have Freddie shipped to her with yet another kind volunteer. Seta quickly earned Freddie’s trust. He has willingly agreed to become the mascot of Posh Paws where you will often find him enthusiastically greeting our pet clients and welcoming them.